This lesson introduces the capabilities of NOAA’s next-generation infrared and microwave sounders, the Cross-track Infrared Sounder (CrIS) and the Advanced Technology Microwave Sounder (ATMS). 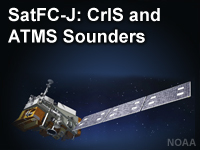 Both fly on board the Suomi NPP satellite mission and constitute the foundation for NOAA’s operational space-based sounding capability on the next-generation JPSS polar-orbiting satellites. In addition to their complementary sounding duties, CrIS and ATMS provide capabilities and improvements for a variety of environmental products essential to weather forecasting and environmental monitoring. Some of these include products for NWP models, clouds, precipitation, aerosols, trace gases, as well as a variety of land and ocean surface properties.